Hawaii is our own special gateway to the exotic world of Polynesia. Because it’s part of the United States, we don’t have to pack our passports or worry about communicating with locals in a foreign language. It’s a tropical paradise right in our own backyard, and every island in the archipelago is special. 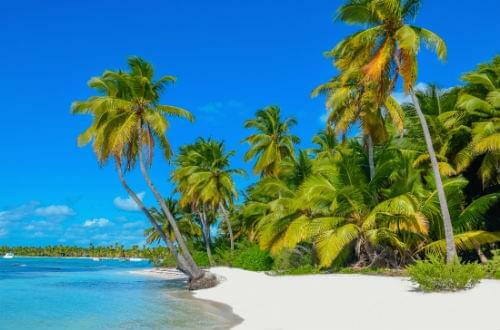 That’s why so many frequent flyers want to use their miles to fly to the islands. We’re going to let you in on four of the best values to get to Hawaii on the cheap. If you haven’t amassed enough miles to get an award ticket to Hawaii, consider the Alaska Airlines Coach Companion Fare. Just purchase one ticket and your companion flies on the same itinerary for just $118 ($99, plus taxes and fees starting at $19). This companion certificate is an annual benefit for cardholders of Bank of Americas Alaska Airlines Visa Signature. Sign up for the card, and you’ll receive a certificate. The company will deposit a new one in your Mileage Plan account each year on your card anniversary. This is a fantastic way for you and a friend or spouse to get to Hawaii without laying out a ton of dough. Other good departure points include Dallas/Fort Worth, which will cost 40,000 Avios in economy or 80,000 in business. That’s an excellent use of your Avios. The online British Airways search engine will find American and US Airways award flights, but you’ll need to call BA directly to book partner Alaska Airlines. Did you know that you can book a United Airlines flight using Singapore Airlines KrisFlyer miles? The two carriers belong to StarAlliance. United flies to Hawaii, but a round-trip flight with United MileagePlus miles would cost 45,000 miles in coach and 80,000 in business. On the other hand, Singapore Airlines charges 35,000 miles for that same flight in coach and 60,000 in business. That means that a family of four would save 40,000 miles almost enough miles for another round-trip coach flight to Hawaii by booking those United flights with Singapore KrisFlyer miles. You can transfer American Express Membership Rewards or Chase Ultimate Rewards to your KrisFlyer account on a 1:1 basis. American Airlines offers reduced redemption rates on flights to Hawaii during its off-peak seasons (January 12 to March 13 and August 22 to December 15). 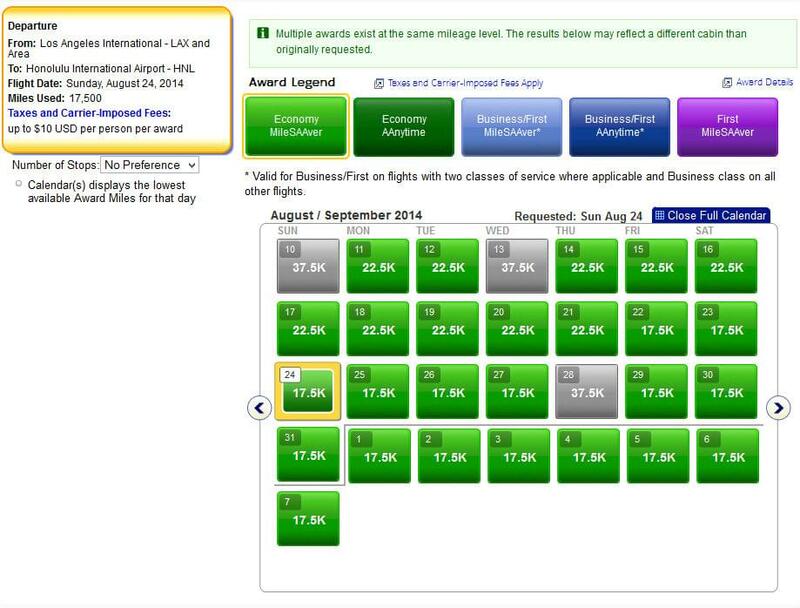 Just look for MileSAAver Level 1 off-peak availability on Americans website. Round-trip economy tickets cost just 35,000 AAdvantage miles compared to Peak MileSAAver Level 2 economy award seats which cost 45,000 miles. 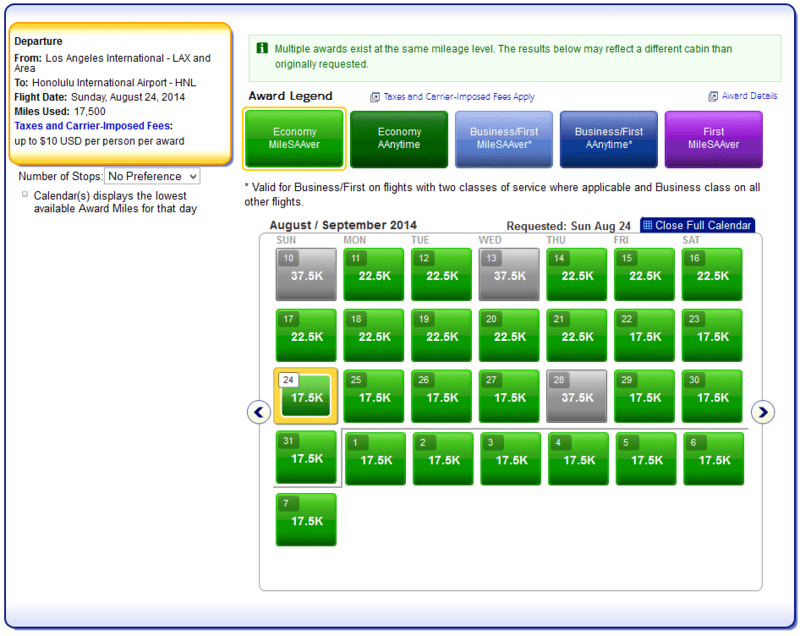 There are no off-peak mileage rates for business and first-class awards to Hawaii so this trick is only good in coach.